When Joan Hinds proposed the idea of 30-Minute Doll Clothes for a Sewing With Nancy program, Nancy’s interest piqued. She asked Joan if the pieces could truly be made in just 30-minutes instead of several sewing sessions. Her answer—absolutely! Nancy gave Joan the go-ahead to submit ideas centering on sewing for the popular 18″ dolls. She sent Nancy sketches and photos. The difficult part was to narrow down the selections for a 2-part TV series! 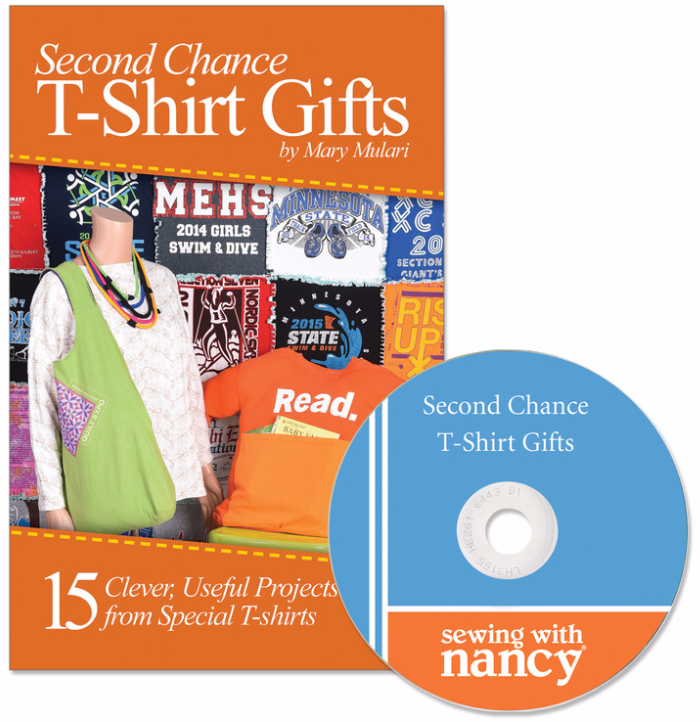 Part 1 is featured in this Sewing With Nancy video. The Birthday Party Trio is a double skirt, camisole, and leggings combo. It’s a mix and match ensemble that is a breeze to create. In the 30-Minute Doll Clothes book and DVD and on the TV show you’ll see how flat-construction tips streamline the process. Dig through your fabric scrap box and search for a pretty little print. With just a few straight seams and 30 minutes of time, you’ll be able to create a skirt. Spend another half-hour of time and stitch a top. The result is a pretty and perky combo. Your favorite little girl can have an extensive doll wardrobe using Joan’s simple patterns and speedy sewing tips. This sundress, the Speedy Sundress to be exact, is so quick to sew that you could create two dresses in just about the same time as sewing one of them. Simplified techniques make it possible. Simply cut 2″ off the bottom edge of the original pattern. A band of two fabrics gives the dress more interest, while keeping the stitching time within 30 minutes. Cut the top band 1-1/4″ wide and fold it in half lengthwise. Place it over the bottom band, which is 2-1/2″ wide. Match the raw edges. Then, stitch the double band to the lower edge of the dress. This doll is set to attend an afternoon tea party. Bolero jacket and dress—a perfect combo—like tea and cookies, will delight any little girl. Our next doll is ready to go shopping. The knit shirt, top, and skirt ensemble is the perfect outfit for a doll to wear during an imaginative Meet Me at the Mall outing. You’ll find all the instructions and patterns for these clothes and more in the book and DVD, 30-Minute Doll Clothes. You can watch this show online—it’s the featured show this week. For a chance to win a 30-Minute Doll Clothes book and DVD, tell us which doll outfit you would like to make for an 18 inch doll. The randomly selected winner of a copy of Mary Mulari’s Second Chance T-Shirt Gifts Pattern and DVD is Catherine H.
Her comment is: I was just in Tallahassee saw a T-shirt at my son’s place, and I asked him to save it for me. He was surprised one could make something from a T-shirt. I explained the items that could be made, but Mary Mulari’s book lists many items I neglected to mention to my son. I would love to win the book. Then, I would be able to surprise my son with several of the items for him, my grandson Jack, and granddaughter Willa. I have Mary’s book on remake of sweatshirts and enjoy using it. The first I’m looking forward to sewing is teatime. I love them all but it’s my favorite! I like to sew outfits that match the material used in outfits for my 8 year old granddaughter who loves playing with her dolls. She names each after her cousins. My granddaughter is just learning to sew. Grammy is teaching her and she is so excited. She loves Tea Time as she loves to have tea parties and dress up. My granddaughters like to shop so they would really like the “meet me at the mall” outfit. So cute. I would love to get the DVD and patterns. I like all of them but Tea Time is my favorite. My young granddaughters live in England and I am always looking for things to make them to mail. Postage is quite expensive to send things there and this would be something that is reasonable to mail and would bring a lot of enjoyment to them. Plan on doing this for Christmas.Thank you for making this available. My 5 yrs old grand-daughter asked me if I could make 20 dresses for her AG doll! These tips will be very helpful! I plan to make the 1st day of school outfit first. So precious and flat assembly will go smooth and quickly. I would start making several ‘speedy sundresses’. I have two young granddaughters and this dress would be great for their little hands. Easy to pull on and off! Shall probably try to purchase the book and DVD. Wonderful resource. Thank you! I would love to make the Tea Time outfit for my DGD, have made many outfits out of the templates pattern. Need this one to round out her wardrobe. I would enjoy making these as much as my grand daughter will enjoy playing with her dolls in these adorable simple to make outfits. I would love to make them all. I started sewing at the age of ten when I made doll clothes for my Terry Lee doll and haven’t stopped since. She is similar in size to the American Girl Doll. I would like to make the Tea Time doll clothes outfit. I would like the book and DVD to speed making doll clothes for 2 grands and 2 great grands. I have been knitting and crocheting AGD clothes and it takes lots of time. Sewing clothes would be a blessing. Thank you. I’d like to make the speed sundress. I have 3 grand daughters and would make each one a tea time outfit and use different colors for each outfit. Then I’d make them one of each pattern. My 5 granddaughters all have 18″ dolls. For Christmas I want to make “meet me st the mall” outfits for each of the girls. Meet me at the mall is my favorite. So cute. Would select “Tea Time” for my granddaughter’s doll as its quiet elegance is perfect for a midday tea! The “Meet Me at the Mall” ensemble and The “Tea Time” outfits are my favorites. I would make them both. I have lots of fabric and a couple dolls who need clothes. I would love to make the ‘Pretty and Perky Combo . I recently visited a ‘rummage sale.’ While there there was 3 antique dolls . I would like to make a few of this outfit. Then gift each one to one of my granddaughters for Christmas . The birthday party trio looks like so much fun. Not too hard to make and easy to put on and off. I would absolutely love to make meet me at the mall outfit, it’s adorable!! I really like the “Meet Me at the Mall.” The little jacket just sets it off to be special enough for Church clothes! Meet Me at the Mall outfit is my favorite. I think I would like to make the speedy sundress! They were all so cute though. It was a tough decision. This would be wonderful to use with my granddaughter to make her doll some dresses. They are all so cute, but I love the speedy sundress! I really like the Tea Time combo. I had a dress similar to that when I was younger! Meet Me at the Mall….But actually just too hard to pick just one since they’re ALL so cute. My grand daughters would LOVE all of the clothes and help grandma make them too. Oh my gosh! I love them all, but if I have to chose I will pick the Birthday Party trio. I would love to win this book, as both of my granddaughters have several American girl dolls and perhaps I could get them interested in sewing some of these outfits for their dolls. I’m having trouble deciding between Birthday Party Trio and the Speedy Sundress. Of course you couldn’t stop there – would have to make them all eventually. I would love to make the speedy sundress with my daughter! I bet she will be able to do it without much help! Tea time is my favorite. The sun dress makes me think of the pillow case dresses my friend makes for her church to take to Guatemala. I have a granddaughter who is just getting interested in dressing her dolls. I think the first thing I would do is the tea time outfit and then make the party time one. I’d make ‘tea time’. So pretty! I love all Joan Hinds patterns and books! She makes it easy to make beautiful doll clothes. I would make the cherry dress with the red bolero because it is so adorable and I have that fabric already! So cute! The Pretty and Perfect Combo would be the very first I would make. I can find 30 minutes. I’ve stayed away from doll clothes thinking it would take all day. Plus they’re so cute! The first outfit I would make is the tea time outfit. I love sewing Joan Hinds doll clothes. I love the updated sun dress version. It would be so much fun to make that with my 5 year old granddaughter who loves dolls and sewing as much as I do. I know my two granddaughters would love the birthday party trio. They love to mix and match outfits so I’d probably make more than one so they would have that options. Lots of great outfits from Nancy and Joan which are quick and easy to make. I think my 9 year old granddaughter could actually make some of the simpler ones herself! I like the birthday party trio. As I have two granddaughters who love dolls, I would make the Tea Time outfit first. They both love to play with each other and that is their perfect theme. But I really love all the designs so I would quickly need to follow up with the rest of the designs. I would make the tea dress outfit. I have made those jackets for granddaughters. I like all the outfits, but my favorite is “Meet Me At The Mall”. I like to make gifts for friends, but have hesitated making doll clothes because of the time it usually takes to do so. This technique looks like it shortens that time and produces good results. I would personally choose to make ‘tea time’. I have always loved bolero jackets and this ensemble is certainly a nice style to dress up a miniature friend! I would like the Tea Time outfit. The Birthday Party Trio really caught my eye! I think I would make it first, then some sun dresses. I would make the Tea Time outfit. I would love to sew doll clothes for a few little girls i know, and would even think about donating some. The Tea dress is cute but would love to do the Bolreo with it. I love to sew doll clothes for my granddaughters even though some of them are getting older and no longer play with them. I always make them new clothes for Christmas. Love the tea dress! I would make the Tea Time outfit. It is really adorable. The sundress would be my first choice. It would be quick and easy to make a matching little girl’s dress at the same time. I would make the Tea Time dress for my Great Niece’s Doll! I love the afternoon tea party: Bolero jacket and dress. I would love to make these. Two of my granddaughters have 18” dolls and I know they would love the Tea Time outfit, and how I would LOVE to make it for them. We could pick out the fabrics together! I can’t believe sewing tiny doll cloths in 30 minutes with success is something I can do. Yet, I know with Nancy and Mary’s help it is possible. I would love to make all of these for y granddaughter’s doll! Tea time for 18” doll. So cute! My granddaughter has a sewing machine for her doll.When I sew, she loves to pretend she is sewing. I let her choose colord for things I embroider for her. I hope to nurture a “Love of Sewing”. She would enjoy the teatime dress for our tea parties. Sewing doll clothes is somewhat intimidating for me because of its smaller size. To think you could make any of these darling outfits in only 30 minutes is amazing! And, if I mastered the techniques with Nancy and Mary’s tips, perhaps I could teach our granddaughter how to sew, as well. How fun! The sundresses look adorable and appear to be a good project for a child to learn to sew! Great ideas! I have lots of scraps, and usually make matching doll aprons, when sewing children & adult aprons. The sundress pattern would be a fun project for my friend’s daughter, who is coming over this summer, for sewing lessons! Love them all!!! After sewing these for my grandaughter, I bought my own doll for a model in my sewing room. So much fun. Pretty and Perky combo reminds me of outfits I sew for my grandaughter. Love this!! Meet me at the mall is a lovely outfit for my grandaughter’s doll to take along with us on our market jaunts with her dolly. My 18″ girls would love to wear the “Tea Time” outfit. They love to dress up and have English tea parties. The bolero and dress are just the perfect combination to wear when going to any type of party but especially for a tea party. They looked at all the outfits and said they would be proud to wear any one of them.